The largest annual celebration in the Tri-State area of the vegan lifestyle is set for April 14, 2019, when thousands of vegans, vegetarians, environmentalists, and allies will march through downtown Manhattan and conclude at Union Square for a festival of speakers, singers and dancers, and merchants selling cruelty-free food and products. Participants will close the day out with an indoor after-party of dancing just a few blocks away, at VSpot Organic, 12 St. Marks Place. 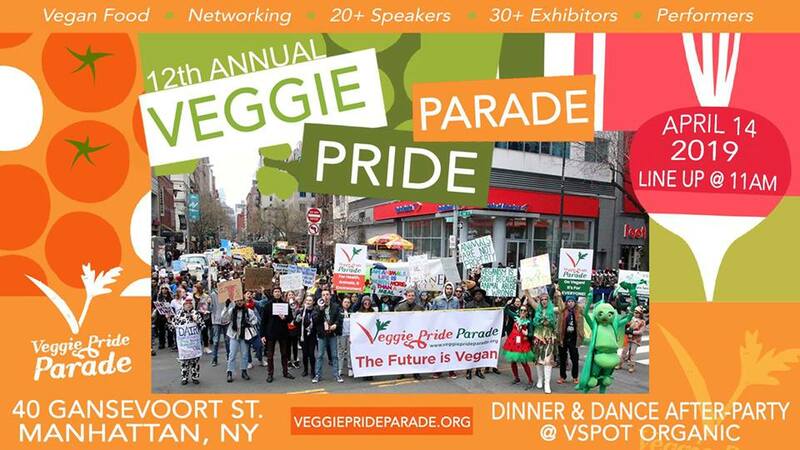 Now in its 12th year, the Veggie Pride Parade celebrates a vegan lifestyle and introduces its beneficial impact on climate change to the public at large. VPP is a family friendly event, with a variety of activities for all ages. Along with the parade at 11AM, there will be a costume contest, performances featuring rappers, singers, hip hop, dance, and acro yoga, and a cooking demonstration stage where people can learn to plant herbs and craft vegan dishes. In addition to the lighthearted fun, many of this years speakers represent politically focused organizations that will be talking the public about creating a greener and more cruelty-free future, including Voters for Animal Rights, NYCLASS, Green Party, Humane Party, and Bronx Animal Rights Electors. “This event is a fun way for the NYC community to learn more about healthy eating and protecting the environment,” says festival organizer Maggie Sargent. The parade lines up at 11:00 a.m. at 40 Gansevoort Street and proceeds to Union Square Park. The after-party starts at 7:45 p.m. at VSpot Organic at 12 Saint Marks Place in Manhattan with an electronic dance party called “Heartbeat,” featuring animal images and starring the 90s inspired DJ Rufus Gibson of Buffalo NY. See below for a a detailed schedule of activities and speakers. Veggie Pride Parade is a free annual event that brings the community together to celebrate an animal-friendly, environmentally sustainable and healthy lifestyle. It includes a parade in Manhattan at noon and a festival in Union Square Park in the afternoon. Veggie Pride Parade is organized by the Humane Party Thunder Fund, the events arm of the Humane Party. The Humane Party was established 2009 as the U.S.’s first vegan, abolitionist political party. 11 a.m.–Lineup at 40 Gansevoort Street. Come dressed in your favorite fruit, vegetable or animal costume. 1:35 p.m.–Bob DiBenedetto, President & Founder, HealthyPlanet– “Who’s More Important, Humans or Animals? 7:45 p.m.–Dinner and Dance Party at V-spot. 12 Saint Marks Place.